Unity Digital iUSB (Industrial USB Flash Drive) is based on USB 2.0 controller and SLC NAND in both Commercial Temperature (0°C~70°C) and Industrial Temperature (-40°C ~ 85°C) which supports USB 2.0 & 1.1 . This Flash USB Drive is designed for OEMs that need a high quality, consistent supply of USB Flash Drives, and/or have special requirements like epoxy sealed, parylene coated or special partitions. 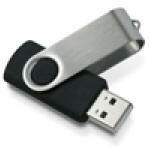 The Unity Digital iUSB supports USB Mass Storage functions and supports USB boot functions from BIOS. This solution is not only easy to install, but also fast, easy to use and low cost.